Posted in Data, News, under North America. Tagged with IIE, Open Doors, USA. Despite the number of international students in the US surpassing the one million mark for the third consecutive year, new student enrolments fell by 6.6% in 2017/18, the latest data from Open Doors has revealed. According to the 2018 Open Doors Report on International Educational Exchange, international student numbers in the US increased by 1.5% in 2017/18 to reach 1,094,792, up from just over 1.08 million in the previous period. However, while the overall numbers of international students increased, new student enrolments declined by 19,098 (6.6%), corroborating findings from the 2017 fall survey and continuing a slowing or downward trend first observed in the 2015/16 academic year. According to the report, current gains in the total number of international students are due primarily to increased participation in the Optional Practical Training program (up 15.8%), which allows international students to practice their skills in the US for up to 12 months or up to 36 months for graduate students in STEM fields. 18.5% of international students were in OPT in 2017/18, up from 16.2% in the previous period. Among new enrolments, declines were seen primarily at the non-degree (-9.7%) and undergraduate (-6.3%) levels. In terms of the origin of students, China (33.2%) and India (17.9%) made up the largest portion of the total, with increases of 3.6% and 5.4% respectively on 2016/17 figures. The largest percentage growth, however, was seen in Nepalese student numbers (14.3%), likely driven by ongoing political turmoil in the country coupled with the after-effects of a devastating earthquake in 2015. Meanwhile, the most notable decline in numbers was seen in students from Saudi Arabia (-15.5%), which follows cuts to the outbound King Abdullah Scholarship Program that has dramatically curbed outbound mobility. 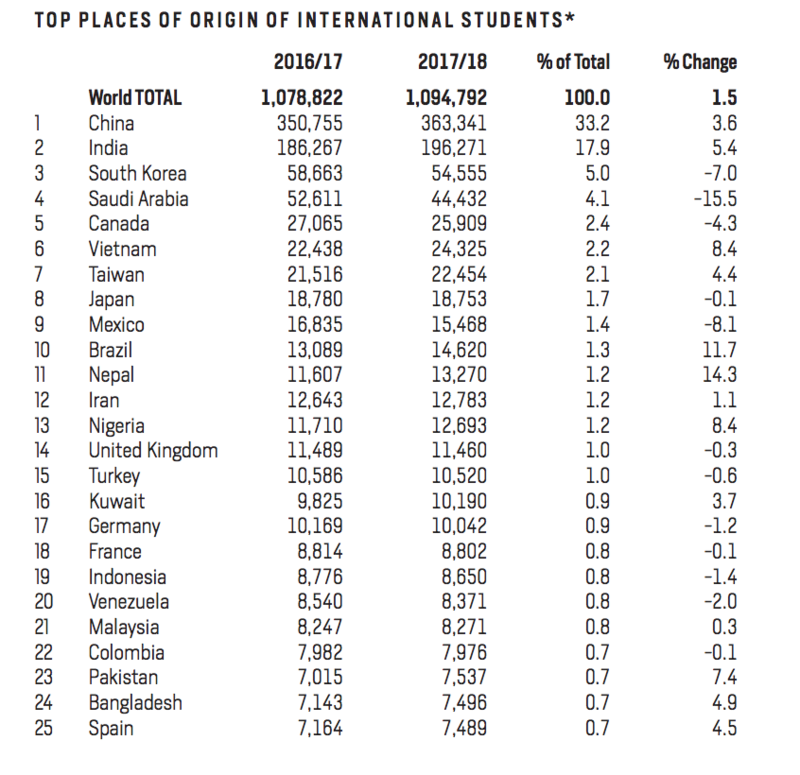 The number of students from Mexico was found to have declined -8.1% when compared with the 2016/17 figures, while the number of South Korean students dropped 7%, following a similar trend in recent years as fewer Korean students have opted to study abroad. Speaking to The PIE News, executive vice president of global engagement and research at Studyportals, Rahul Choudaha, described the 6.6% decline in new enrolment as “an ominous trend”. “OPT has been a significant boost for the enrollment in STEM-focused programs, especially at master’s level. Excluding OPT, the effect of anti-immigrant rhetoric becoming more apparent in the decline of new enrollment at both undergraduate and graduate levels; a decline of 6.6% in new enrollment is an ominous trend,” he said. Choudaha said that while student choices are driven by a complex interplay of variables, “anti-immigrant rhetoric has surely slowed the growth momentum for a segment of students”. “For example, the appetite to study abroad remains strong in India, but the rhetoric of stricter immigration and post-study policies played an important role in the decline of 8.8% at graduate level enrollment in Fall 2017/18,” he added. Additionally, the report showed that international students continued to make a significant financial impact on the US in 2017, contributing $42.4 billion (up from $39bn in 2016) to the economy through tuition and other expenses, according to the US Department of Commerce. Marie Royce, assistant secretary of State for Educational and Cultural Affairs said that international students studying alongside Americans are a tremendous asset to the US. “We need to develop leaders in all fields who can take on our toughest challenges. We need people who can find solutions that keep us secure and make us more prosperous. We want to send a message that international education makes us stronger as a country,” she added. As for US students, study abroad numbers were revealed to have grown by 2.3% to 332,727 in 2016/17, while the profile of US students going abroad has also continued to diversify. The number of students who identify as racial or ethnic minorities who studied abroad in 2016/2017 was 29.2%, compared to just 17% in 2005/06. “Expanding access to opportunity through international education helps us build stronger ties across the world,” said Allan E. Goodman, president and CEO of IIE. But while the US has always been the most preferred destinations for many international students, remarked Choudaha at Studyportals, this is the first time higher education institutions have to persuade international students about the attractiveness of the US as a destination. This academic year commencing Fall of 2018/2019 will not fair any better when results come out next year. Strong dollar compared with all other emerging market currencies Plus a falling yuan will have an impact on US market. Global economy is slowing and there are some headwinds that could tip the world into recession. and not be broad based.